The medical marijuana industry in Arizona has scored another victory in the courtroom that will have positive repercussions for some cannabis entrepreneurs, at least in the near term. A county superior court judge ruled that the state cannot deny certificate renewals for dispensary owners who are not yet selling cannabis to patients. Translation: Dispensary hopefuls who received initial approval from the state to move forward but won’t meet an August deadline to launch will get a temporary reprieve, giving them the opportunity to apply for an extension, secure final state authorization and open their doors. The decision represents yet another loss for local officials who are seemingly bent on making life as difficult as possible for MMJ businesses. Roughly 70 of the 98 groups that won the right to open a dispensary in a lottery last year have received final state approval to operate, according to the Arizona Department of Health Services, and most of those have opened or will soon. The other two dozen have not received their registration certificates. All of these dispensaries have until Aug. 7 to begin selling cannabis, with the state threatening to rescind the initial approval – and bar the applicants from ever running a dispensary in Arizona again – if they do not launch by the deadline. However, numerous legal challenges over the past year threatened to sink the entire program or completely change the playing field, and some dispensary hopefuls waited on the sidelines to see how it would all play out before investing money and time into the process of opening an MMJ center. The judge expressed sympathy for those owners, saying they should be given more time – or at least a process to go through to get an extension – given all the uncertainties and challenges they have faced. That doesn’t mean every dispensary will get a pass going forward. Rather, the judge said the health department must now rewrite its rules to give delinquent dispensaries an appeals process to lobby for more time. The idea is that entrepreneurs who face delays because of outside circumstances would have an opportunity for an extension, rather than those who miss the deadline because of their own operational setbacks or blunders. Until those rules are finalized, though, all dispensaries that missed the initial deadline will have more time to get up and running. A spokesman for the health department said it will take at least several months to rewrite the rules. Despite the positives tied to the judge’s decision, there are some negative repercussions as well. Kaufman said the appeals process will take months to resolve. “The bottom line is that fewer than the 126 dispensaries will open by Aug. 7, 2013, if not by Aug. 7, 2014,” he said, adding that this will also likely delay a second round of applications for dispensary certifications. The first dispensary in Arizona opened back in December, and since then dozens more have launched. Roughly 40,000 patients have signed up for the state’s medical marijuana program, representing about .06% of the population. 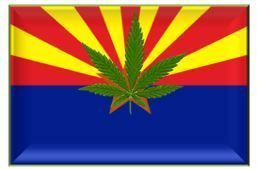 AZ politicians,especially Republicans, have habitually opposed the medical cannabis program. They continue doing so without any regard for the patients that are finally able to effectively control their pain without horrific prescription medication side effects and regain their lives. These people don’t want to hear the facts supporting the positive results being gained due to the medical cannabis program. Next election there needs to be a house cleaning at the capitol from the top down. Cannabis has been used thousands’ of years by countless civilizations. For medical and for pleasure. Try to educate you selves. Jack Herer’s book “The Emperor Wears No Cloths”. People need and want cannabis. The ruling class has theirs. Sounds like the only one constantly making money is the lawyers. Colorado Dispensaries should ban together, with you pulling you resources together you could afford a better lawyer, and you would not have to spend $60K in lawyer fees every time they fill like changing the laws. this way it would not be as profitable as for lawyers fees.